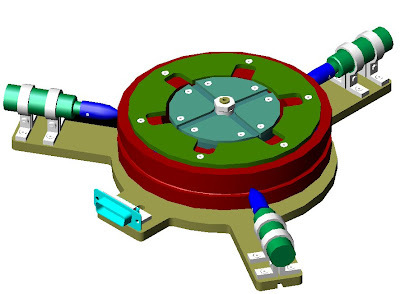 Working in conjunction with magnetic torquer coils which align a satellite with the earths magnetic field, the reaction wheel is a device used to orient a body in space, that is "point" it in the direction of something you want to look at or face toward such as the sun or earth. 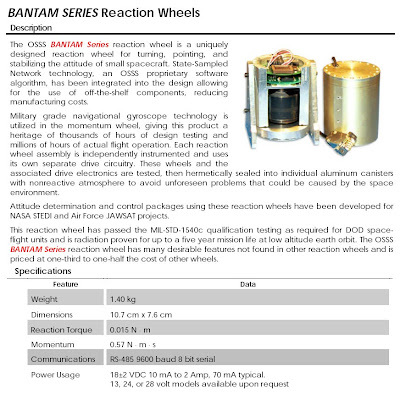 The Bantam series reaction wheel is a mechanical bearing system unique in its construction because it used referbished F-4 Phantom Gyro motors. Although referbished, these motors proved to be a robust, reliable, inexpensive and effective solution to the needs of the customers we worked with. The system works using the geometry of a tetrahedren as shown here where the axes of each motor points to the center of the tetrahedral geometry. Delta Design And Engineering Solutions is currently researching designs on an improved system.